Home » Uncategorized » Trump: Trojan Horse for the Establishment or Mighty Mouth for Mankind? « Whirled Politics: Would you rather be Trumped or Pillaried? I’ll even acknowledge that perhaps it takes someone as brazen and blusterous as Trump in order to stand up to such a powerful assemblage of egoists as we have embedded in congress and in the president’s administration, which now rules by decree. Nearly all of them strive to make sure you have only globalist options to vote for; but their new-world odor is, I’m sure, a stench that rises all the way to heaven. This derelict congress is a worse evil than either candidate as it continues to sink the US deeply into debt with no plan or action to right the economy since it first capsized in the waves of the Great Recession. Each party is more worried that the other party will get credit than they are concerned about saving the nation, and there is nothing less patriotic than putting your party before you country. My desire to see the economy righted and the establishment overturned (peacefully), however, is exactly what makes me cautious about any gold-plated politician who has lived all of his life in the realm of the one percenters and who has defaulted on more grandiose debts than anyone I know. Nevertheless, while I have never liked this particular publicity whore, I’d put up with his relentless boasting and forgive his audacious past if it takes that kind of brassy, risk-taking adventurer to find someone with enough spine to stand up to the intimidations of congress. I’m willing to admit that it might take all of that, so whether or not I like him is not important unless it is leading me to see flaws that may mean Trump is not what he makes himself out to be. Overturning a vast global establishment is the kind of battle that will take someone with unbelievable tenacity, intelligence, and courage. The opponents are rich, and you can be sure some are willing to kill to keep the status quo that is making them immensely rich (and have killed). Unfortunately, I have seen often in life that bellicose people are usually nowhere near as brave as they sound. People like Ike, who was strong in war and humble in attitude, are usually the ones with real courage. It is not usually the most blustery people who have the deepest strength to carry through with the right thing for the right reasons, regardless of cost to themselves. Trump is aptly named for how often he blows his own horn in order to create his own image; but his actions show he backed out of previous presidential races when it was clear they weren’t going to be an easy win after getting lots of publicity for teasing people with the possibility that he’d run. He has also backed out of many a business deals when things got rough, rather than push forward to try to make things work. You can do that in business through bankruptcy, but you don’t have the option when you are president and things are not going your way; and a triumphant Trump is guaranteed to have a congress that does not go his way (unless he capitulates to the Republican side … as he now appears to be doing with every decision he makes). Is Donald Trump a Trojan Horse? Trump looks like victory to us anti-establishment voters on the outside, but what lurks inside of this man? Is he as hollow as his mouth is big? (You could land an airliner in that thing and still have room to park the USS Nimitz.) The reservations I’m going to express about Trump in this short series this week are based solely on his political actions, not on the brassy stuff that I personally dislike. That’s why I cleared those concerns out of the way first to make it clear that I acknowledge that a huge ego could be what it takes to combat the establishment. Much to my disappointment, Trump’s actions run completely opposite of his words every time we see him make an actual political decision. While Trump sounds so bold in his political incorrectness that I might be inclined to think as many others do that he was actually trying to throw the election by being as unlikable to the majority as he can be, I know and he knows (and you do, too) there are a lot of angry people who need someone to voice their anger. Trump knows he can tap into a huge vault of anger; and, as a media mogul himself, he knows better than anyone how to play the media for free publicity by being outrageous — something for which he’s always had a near whacky knack. We’ve seen him do it for years, even when he was not running for office or when he ran and quit. He’s done it to keep the Trump name, as a brand, always in the media, always on the public mind, always associated with “greatness” and “wealth” because that is the kind of real estate he develops and sells. He caters to the wealthy. That’s his brand, and nothing could give it more cache than the presidency of the United States. While those are my reservations, it’s his latest political actions that concern me. In the few places where we have seen Trump make actual political decisions so far, his choices have been 100% pro-establishment as I pointed out in a recent article titled “Whirled Politics: Would you rather be Trumped or Pillaried?” I wished very much to see something different than what I am seeing. From Trump’s choice of a 180-proof neocon vice presidential candidate to an embedded Goldman-Sachs campaign financial manager to the Heritage Foundation’s dream team of budget advisors he assembled, Trump has selected people who wholly embody the establishment. Everything these people have ever done or said has been in support of the Wall Street one-percenters, in support of financial deregulation, and, for the most part, in support of the military-industrial complex at the cost of any debt imaginable. The team he creates says everything about where he intends to head. To be clear, I am for a strong military and not against all wars. I believed and still do believe that going to war in Afghanistan was right and justifiable, but it was stupid later on to divert available resources from Afghanistan to Iraq, which had nothing to do with 9/11 nor with sponsoring terror against the US nor with buy zolpidem from india developing weapons of mass destruction. We should have spent that money winning the peace in Afghanistan by building something good there in the place of what we tore down. Instead, we created a power vacuum in the now disintegrated nation or Iraq, which is rife with internal rivalries and, so, became the ideal incubator for ISIS. That is exactly the kind of result I told friends I feared when I first heard King George Bush II wanting to engage Iraq in a war. I think neocons have taken us into ill-conceived, unjust, pre-emptive wars aimed at recreating the world in our image. We have slaughtered hundreds of thousands of unseen people who never raised a finger against us and most likely never would have in wars that have been monstrous failures. After Iraq, we backed a coup in Crimea, a civil war in Libya, and seem to be shooting ourselves in the foot in Syria because we’ve returned to the Vietnam practice of fighting wars from Washington. (That, however, is due to Obama and his ilk, not due to the neocons.) We’ve now got war everywhere. If we think the people who remain alive in those countries are going to thank us for killing their brothers and sisters or sons and daughters or their fathers and mothers in order to save them from a single despot, we are sadly and deeply self-deluded. We may think the despot was their deepest concern; however, as with all people, it turns out family is first. We have created nations filled with people who hate us just because we think we know best what government is good for them (and, frankly, for oil and the economic gain that fighting brings us). Politicians like Killary and Trump’s VP, Pence, backed these wars 100% and have spent a nation’s ransom trying to force change upon a world that has no intention of changing — a world that, if it did become democratic, would use its vote to declare war on us for killing their brothers and sisters. Hillary started some of these wars herself (at least, initiated our involvement in them). Pence strongly advocated for every one. Power-drunk politicians in both parties support these missions in order to control the world and its wealth, for most of them are globalists and elitists at heart who serve Wall Street. The rest are misguided fools whose minds have been consumed by their own dogma. They vote for these wars because numerous American corporations get wealthy making equipment to replace the machinery that gets blown up; they get wealthy pumping fuel into the engines and making new tires to replace rubber that is too worn to meet the road. The more of that equipment we burn through, the more they can get the government to pay to replace it. These politicians are owned by the corporations that make this hardware. The best of them believe that, by serving those corporations, they are serving the American economy; the worst of them are courtesans who simply love to be wined and dined and admired. And why do I point all that out? Because these are the people Trump is assembling as his leadership team. So, if you think Trump is any threat to the establishment, you may be riding a Trojan horse. As soon as I learned that Trump chose Larry Kudlow and Steven Moore to be his senior economic advisors, I feared he was selling out to the establishment in order win Republican support (and probably because Trump is a big-idea man who always looks to others to come up with the particulars that will make a big idea work, but he’s picked the wrong others). I have a file full or articles on Kudlow that I keep in my “Idiot Box” where I store the stupid things economists and Wall Street moguls say. Larry is soon to become (again) an article of his own. That is the team assembled inside the Trump horse. On the outside, it is all Trump, brazen and shiny and bold. On the inside, it is entirely Wall-Street warriors and neocon combatants. In the next article in this series, I’ll dig into the Kudlow-Moore tax plan which gives us the major components of Trump’s action plan in order to show how deeply establishment Trump’s plan is in its debt-based economic expansion and its retreaded, spiffed-up, establishment ideas that got us where we are today. Be careful that you don’t believe something just because you want to believe it so badly. That is how the citizens of Troy were conquered in the Trojan war. I’d love to have an anti-establishment candidate roll in, too. Sadly, I don’t think I do (at least, not economically). The time to hold Trump to task is now, not after the establishment makeover turns him into their Trojan Trump card, but while they are trying so that they don’t succeed. 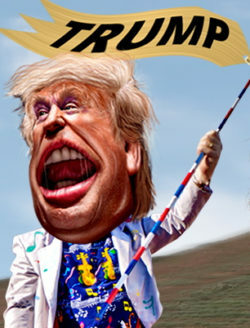 The brazenly boisterous, blusteringly bellicose, trumpeting Trump. Who is the man behind that mighty mouth?